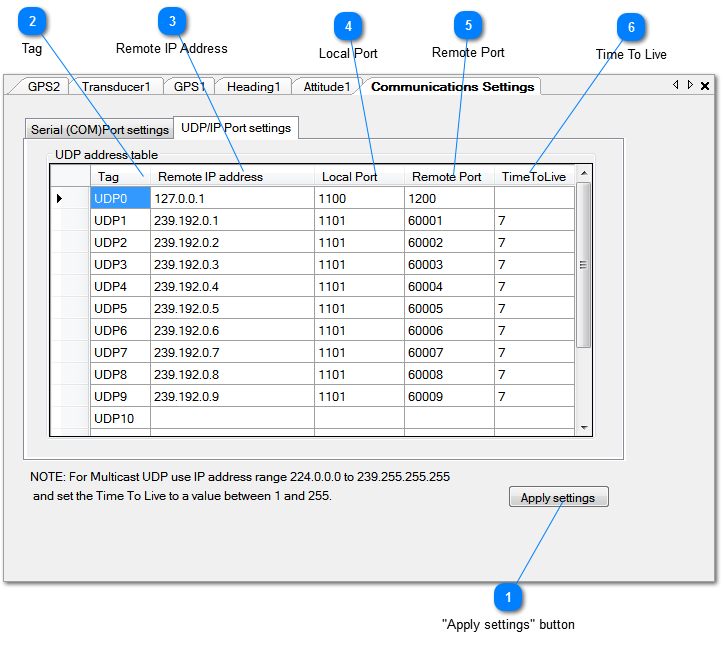 Apart from the serial ports NemaStudio also supports a maximum of 16 UDP/IP ports, tagged UDP0 up to UDP15. You can mix UDP ports with serial ports if you like, or assign different ports or the same UDP port to any or all instruments. From Version 1.27 NemaStudio also supports UDP Multicast. Reference to the UDP port to use. The IP address of the remote system. Observe that for UDP Multicast the address must be in the range 224.0.0.0 to 239.255.255.255 and that the TimeToLive must be > 0. The remote port number to use. "Time to live" time setting when using Multicast. the TimeToLive is set to a value between 1 and 255. Check with your network administrator for the correct setting.